My friend, Larry, died a few months ago. It seems he was always wearing a Hawaiian shirt. Funny, the things you don't really notice when someone is alive but once they are gone...it makes you think. His sister-in-law mentioned his shirts at his memorial service; in fact she brought them to the service. I immediately saw "FABRIC" and offered to make a memory quilt with the shirts. She gave me 13 of his shirts. I chopped them into 4-1/2" strips because I knew I wanted to make a St. Louis 16 patch to show off the prints on the shirts and get it done pretty fast. This is what remained of the shirts. I was able to get about 12 strips per shirt. Mr. R and I took the quilt to our local park for a photo shoot on a lovely evening. I named this quilt Larry's Gone Fishing...I don't think it needs any further explanation. Larry was an amazing fighter. Diagnosed with cancer of the hip bone (in 2006) just 6 months after his beloved wife died after a 7 year battle with breast cancer, he could often be seen walking around our local lake with his walker. He was not an old man, just 65 when he died, but he didn't have a hip joint! He hired a golf coach to re-teach him how to golf so he didn't have to give up the sport he so enjoyed. He traveled to Hawaii, often, and went camping with his friend and caretaker. He never gave up the fight. Whenever I saw him at the grocery store he had a smile on his face and always said "life is good". I learned so much by knowing Larry. This quilt will be given to his sister-in-law and her family. Larry and Kim did not have any children and he was an only child, but you would never have believed this at his memorial service. The church was full of people who called Larry "family". 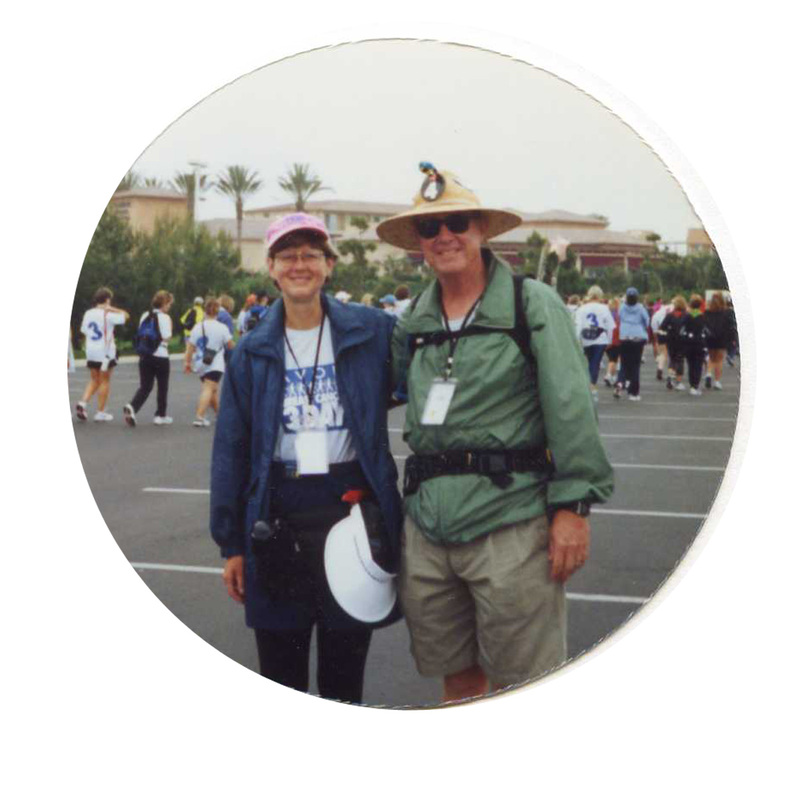 I met Larry and Kim in 2001 when we were all training for a 3-Day, 60 mile walk to raise money for the Susan G. Komen Foundation. We lived in the same neighborhood, but it was through the many hours of training that we became friends. So Larry, a fond farewell...but you will be forever in our hearts. And your memory quilt will keep your family warm and be a gentle reminder of the wonderful example you were to all of us. This quilt was a joy to make. The pattern is so easy and sews up really fast. I had a hard time deciding on the backing and in the end it was the wrong green, but it is a happy color and that is all that matters. I used my walking foot to straight line quilt on either side of each vertical and horizontal seam. The binding was in my stash from my early days of quilting. The quilt had so much going on I think the grey-beige color actually frames it nicely and is not as boring as you might think this color would be. I used the glue basting method to attach the binding and I must say I am a total convert. I will never use binding clips again. The glue basting method takes a little longer, but it is so easy to sew and makes really nice, crisp corners. I love this quilt and its story. What a beautiful memory. I also loove that you made it with Hawaiian shirts- oh how I love that place. These make for a fabulous looking quilt. What a beautiful gift... It will bring smiles when the tears are gone. Just amazing Di. What a beautiful tribute to your friend and a precious gift for Larry's family. What a beautiful tribute to a man who loved life and was an inspiration to all who knew him. Your quilt must mean so much to his sister in law, what a treasure! Wow what a wonderful tribute to a good friend. That was really lovely, Di. A sad, but beautiful story Di! I have shed a tear or two reading Larry's story. He sounds like a wonderful man who indeed had a whole family of friends....Thank you for sharing a small part of Larry with us. Di what a lovely post. So glad you were able to make something lovely for his family to remember him by, your friendship with him shines through. What a beautiful post and tribute to your friend. 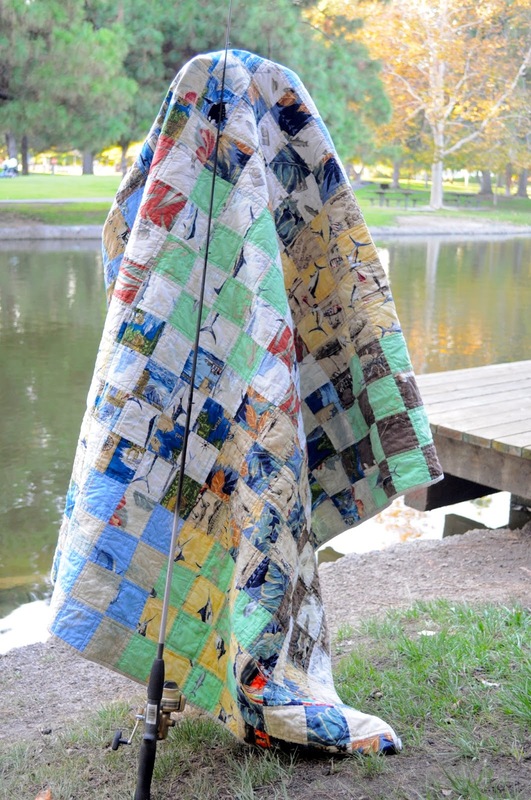 Your quilt turned out wonderful and I am sure it will bring many happy memories to his family. The quilt is absolutely beautiful, and what a lovely tribute to a wonderful man. Di I am so sorry for your loss. He sounds like a great man with the right outlook on life. I know his family will be so thankful for this special quilt. What a lovely tribute to Larry - the quilt and the story - he sounds like he was quite a guy! You are a good person doing this for his family, Di! Such a lovely gift for his family to remember him by. It's a lovely keepsake for them. So sorry that cancer took another life. What a lovely quilt and a beautiful story. It is so wonderful that you had such a lovely friend. What a lovely quilt, and your description of your friend and his story brought a tear to my eye, sounds like he was a great guy who made the most out of his life. Beautiful memory quilt! It is always amazing and moving to give these types of quilts to a family. I just finished 4 myself for a family. What an awesome tribute to your good friend Larry. He is with his beloved wife now and they are smiling down at you - so proud of this beautiful creation you made Di! The quilt is awesome, and so are you! What a wonderful gift for his family! It is such a wonderful story behind this quilt. 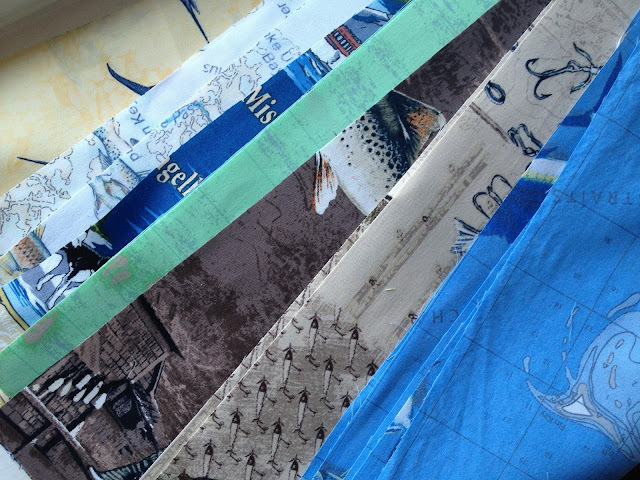 Really love the way you have used these special shirt fabrics. This quilt is a great tribute to someone so dear. Beautiful quilt - great design choice. Well done Di - i'm sure it will be cherished for a long time. I'm sorry for your loss! A very moving blog post and a fabulous tribute to an inspirational man. What a touching blog post and such a lovely memory quilt!